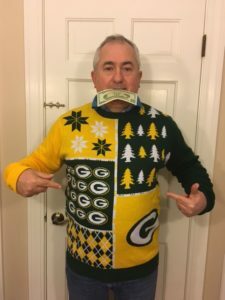 Once again, Stewart Brown, ardent Chicago Bears fan, has to take this year’s forfeit (and ritual humiliation) as he loses the annual Bears/ Packers bet with Independent client, and Green Bay Packers fan, Beth Hassler. Maybe next year for the Bears ? Comments Off on Packers win again !